With the inclusion of an alloy scaffold hook and alloy snap hook, the FA30 303 15 / 20 1.5-2m shock absorbing webbing lanyards are ready to be put to work immediately. The 1.5 metre and 2.0 metre lengths on offer let you pick the lanyard which fits your needs. The lanyards themselves are made with 30mm wide polyester, which is a material known for its strength and resistance to wear and tear. The shock absorbers themselves are 30mm in width with a 44mm web shock absorber which can drop the force of the fall to under 6kN, which will help avoid injuries to users. At each end, the abrasion resistant webbing-protected loops come with the aforementioned fittings. This means you do not need to add your own, or worry about the quality of the kit you are using. If you would prefer to prep your lanyard using existing components you already own, then the FA 30 303 15 / 20 should be a good investment. 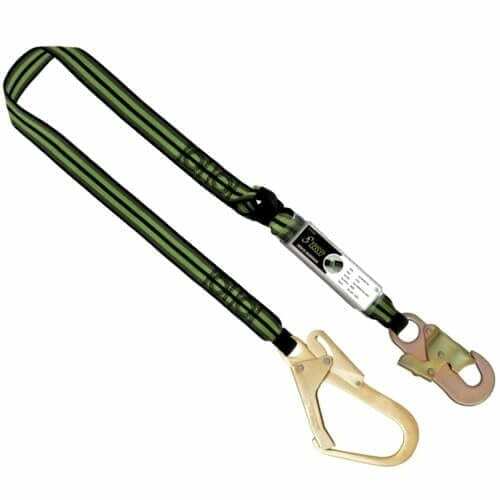 We also stock forked shock absorbing lanyards if an alternative webbing configuration is what you need. Some of our lanyards may be included within one of our safety harness kits. If you have a burning question about our height safety kit, including lanyards, then you can contact us for an expert answer. Just dial 01384 78004 to get in touch with our team for a chat, or enter your info into our site for a reply via email. 1.5-2m Shock Absorbing Webbing Lanyards - FA30 303 15/20 Overall rating: 5 out of 5 based on 6 reviews.